SOON TO BE CLAIRE DARLING—A MAJOR MOTION PICTURE STARRING CATHERINE DENEUVE! When a wealthy woman decides to sell all of her worldly possessions, she unearths the secrets of her family’s past in this charming debut. On the last day of the millennium, sassy Faith Bass Darling, the richest old lady in Bass, Texas, decides to have a garage sale. With help from a couple of neighborhood boys, Faith lugs her priceless Louis XV elephant clock, countless Tiffany lamps, and everything else in her nineteenth-century mansion out onto her long, sloping lawn. Why is a recluse of twenty years suddenly selling off her dearest possessions? Because God told her to. As the townspeople grab up five generations of heirlooms, everyone drawn to the sale—including Faith’s long-lost daughter—finds that the antiques not only hold family secrets but also inspire some of life’s most important questions: Do our possessions possess us? What are we without our memories? Is there life after death or second chances here on earth? And is Faith really selling that Tiffany lamp for $1? Lynda Rutledge, a fifth-generation Texan, has petted baby rhinos, snorkled with endangered turtles, and dodged hurricanes as a freelance journalist, while winning awards for her fiction. 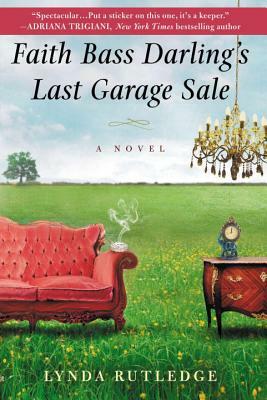 Faith Bass Darling's Last Garage Sale is her first novel.